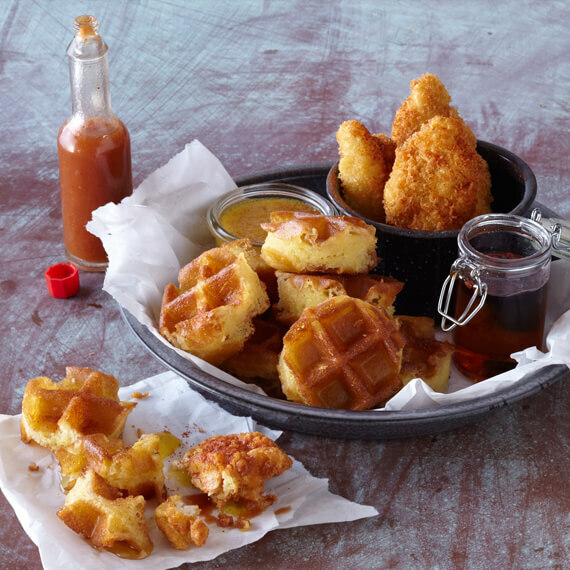 Chef Chauhan has embraced southern soul food at her restaurant in Nashville, Tennessee, and no dish shows this better than her Hot Chicken and Royal Basmati Rice Waffle. Top this delicious take on a southern favorite with mango ginger butter and pink peppercorn syrup for a sweet and spicy treat. 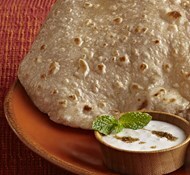 *Royal Basmati Rice flour: Blend Royal Basmati rice in a blender till completely powdered. Sift and use. Whisk together the flours, sugar, baking powder, baking soda, cinnamon and salt in a large bowl. Whisk together the buttermilk, eggs and oil in a separate large bowl. Add the wet ingredients to the dry ingredients and whisk until the mixture just comes together. 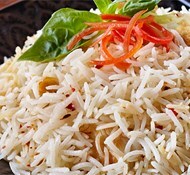 Add the Royal Basmati Rice and fold until just combined. Let mixture rest for 10 minutes. While the mixture is resting, heat the waffle maker. Brush the waffle grates with some of the melted butter and make the waffles according to the manufacturer’s directions. Whisk together 1 quart of the buttermilk, 2 tbsp salt and hot sauce in a large bowl or large baking dish. Add the chicken, turn to coat, cover and refrigerate for at least 4 hours or overnight. Stir together the flour, garlic and onion powders, paprika and cayenne in a large bowl and divide among 2 shallow platters. Season generously with salt and pepper. Drain the chicken in a colander and pat it dry. Dredge the pieces a few at a time in the flour mixture and pat off excess, then dip in the remaining 2 cups buttermilk and allow excess to drain off. Dredge in the second plate of flour and pat off the excess. Put the chicken pieces on a baking rack set over a baking sheet while the oil heats. Pour about 3 inches of oil into a deep cast iron skillet; the oil should not come more than half way up the sides of the pot. Put the pot over medium-high heat and heat the oil to 375°F on a deep-fry thermometer. Working in batches, add the chicken pieces to the hot oil, 3 or 4 at a time and fry, turning the pieces occasionally, until evenly golden brown and cooked through, about 20 minutes. Remove from the oil with a slotted spoon and transfer to a rack to drain; repeat to cook the remaining pieces. Combine all ingredients in a blender and blend until combined. In a small bowl whisk together all ingredients. Place waffle on plate, top with 2 pieces of fried chicken, and a dollop of butter. Pour syrup over top.